The South Stream pipeline, financed by Russia's state gas giant Gazprom, would ship gas to western Europe via the Balkans, thus avoiding Ukraine. But the European Commission says the pipeline may break EU competition rules and asked Bulgaria to suspend work. Serbia's prime minister has denied his country has also halted building work. Reports on Sunday had quoted Serbian ministers as saying the work was on hold until the EU, Russia and Bulgaria resolved their dispute. But speaking on Monday, Prime Minister Aleksandar Vucic said no such decision had been made. Serbia is in talks with the EU on joining the bloc. Bulgaria is already an EU member state. Construction work on the South Stream pipeline began in Bulgaria in October 2013. It is intended to deliver Russian gas to southern Europe without passing through Ukraine and if built, it would deliver 63 billion cubic metres of natural gas a year. 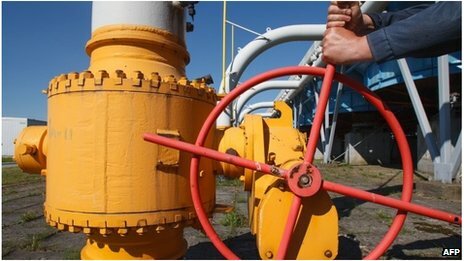 The project was initiated amid disagreements between Gazprom and Ukraine and Belarus over the pricing of Russian gas, which led to gas supplies to some parts of Europe being cut off. It took on added significance following the upheaval in Ukraine. But the European Commission says Bulgaria may have broken EU public procurement laws by choosing local and Russian bidders for its part of the pipeline, and earlier this month, asked Bulgaria to stop work. On Monday, Russia's EU envoy Vladimir Chizhov said the move by Brussels was a "creeping shift to economic sanctions against Russia". "It is hard to shake off the feeling that the European Commission's blocking of the start of work on the construction of Bulgaria's key section of South Stream has been done for purely political purposes," Russia's Itar-Tass news agency quoted him as saying. Bulgaria has previously said it is being targeted by Brussels as a means of retaliating against Russia over the situation in Ukraine. Bulgarian Energy Minister Dragomir Stoynev said on Sunday that the project remained "irreversible and important for both Europe and Bulgaria" and that he was sure a solution would be found. The EU and the US have imposed sanctions on a number of Russian individuals and companies following Moscow's intervention in Ukraine and its annexing of the Crimean peninsula, but Gazprom has not been targeted. The firm supplies 30% of Europe's gas - some 15% via Ukraine - and has warned exports will be affected if sanctions are expanded. Meanwhile, Gazprom has also threatened to cut supplies to Ukraine over an unpaid gas bill that it puts at more than $2bn (£1.2bn). This too would affect European supplies.